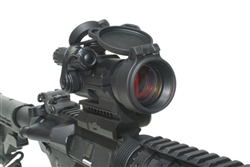 Aimpoint Patrol Rifle Optics still worth the money? One thing is for sure is that Aimpoint has seen some serious competition this year and there are plenty of products in the same durability and battery life that Aimpoint has boasted about. We’ve been seeing major changes to the red dot market, but we still see the sales and demand for the Aimpoint PRO. 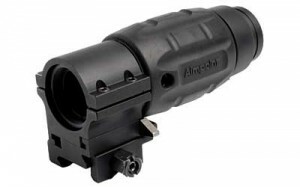 One major selling point in comparison to all of the others out there is that the Aimpoint Pro has been around for so long that you aren’t going to have to worry about recalls. 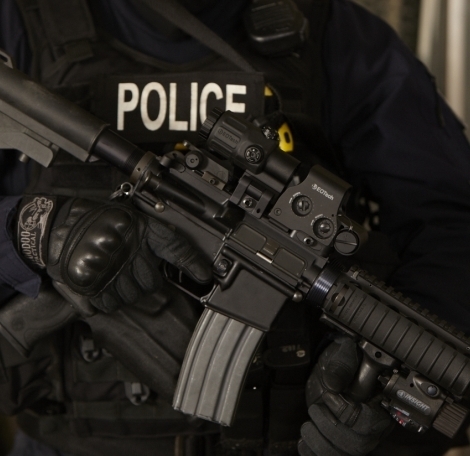 We’ve seen lots of recalls in this industry from firearms, to optics and gun magazines. The durability of the glass and the mount is a proven design and still worth that $400 price range. Lots of people have problems properly mounting optics and the way this optic is designed it’s virtually impossible to over torque it and all you do is put in your rifle and tight it down. 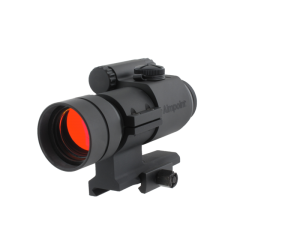 We will continue to stock the Aimpoint Patrol Rifle Optics because they still haven’t lost value like some of the higher priced Aimpoint products and is still a staple for Law Enforcement, military and even hunters. With most hunting up here in the North East especially deer hunting being under 100yds red dot optics are excellent options for deer and turkey. It makes a lot of sense to have a red dot sight on your handgun because after all, remember how easy it was to use your Laser Tag gun? Yes, that did have a red dot built into it and it was fun and easy to shoot. Most people think red dots are for rifles when in all reality, it’s because putting a red dot optic on a handgun is often a hassle and needs a gunsmith that most people don’t want to deal with the fact that they need a gunsmith and have to wait for it to get done. We sell a lot of rifle and pistols sights and reference a local gunsmith so they can have them get put on fairly quickly. Another hassle of having optics on your handgun is trying to find a holster that will mount the gun properly and protect the sight. Other than that, it’s going to be much easy to hit moving targets and acquire them with an optic. I will say that the vast majority of my experience is with the Trijicon RMR optics and they have a proven history of working, but just like we are seeing red dot prices for rifles come down, with companies like Vortex $200 red dots and even Trijicon coming out with a commercial market $450+ red dot, people have found that companies like Burris and Vortex are really taking a chunk away from Trijicon with their own product line. I will say that track records really matter because there is always going to be a failing point. The companies that have ties to the military have the longest history of putting stuff out that lasts but there are always going to be pros and cons and definitely educate yourself on the warranties before you buy. Eotech Mini Red Dots are also something to consider checking out but it’s always nice to find a place that you an look through before buying. With sights like this there is always one that works better with your eyes and that’s how you should choose them. There are plenty of good deals that you can get on used optics, we’re actually thinking about taking in some used optics because in all reality, how much is a 2yrs old Aimpoint Patrol Rifle Optics worth? I’ve purchased plenty of firearms that holster wear or were technically used, but probable had less than 500rds through them. Optics really don’t loose value, or shouldn’t. One thing you have to be careful about when shopping on Ebay or Amazon, is that sometimes if the price is too low, it might not be what you think it is. There is a great post from Larry Vickers that had a student show up in a class and didn’t know he had a knock off Aimpoint. Unless you have a friend getting divorced I doubt you’ll find any used Eotech, Aimpoint or Meprolight M21 for under $325 that is real or working condition so beware. I understand the reason for red dot optics, but just never adapted to it, I see a lot of Special Ops guys running the Aimpoint T-1 and I get it, but my eyes track the Eotech Sights much better and the Meprolight M21 Bullseye is 90% of what an Eotech is with maybe 10% difference as far as Pros and Cons. If you noticed, Eotech has discontinued several optics all due to the mounts that they use to have and now are sold with QD mounts. That is something worth thinking about because a broken optic that needs to be removed with a tool is not something you are going to want to do under stress. The Aimpoint Patrol Rifle Optic is probable the best of everything, longer battery life, night vision compatible, excellent mount, but do you need night vision? 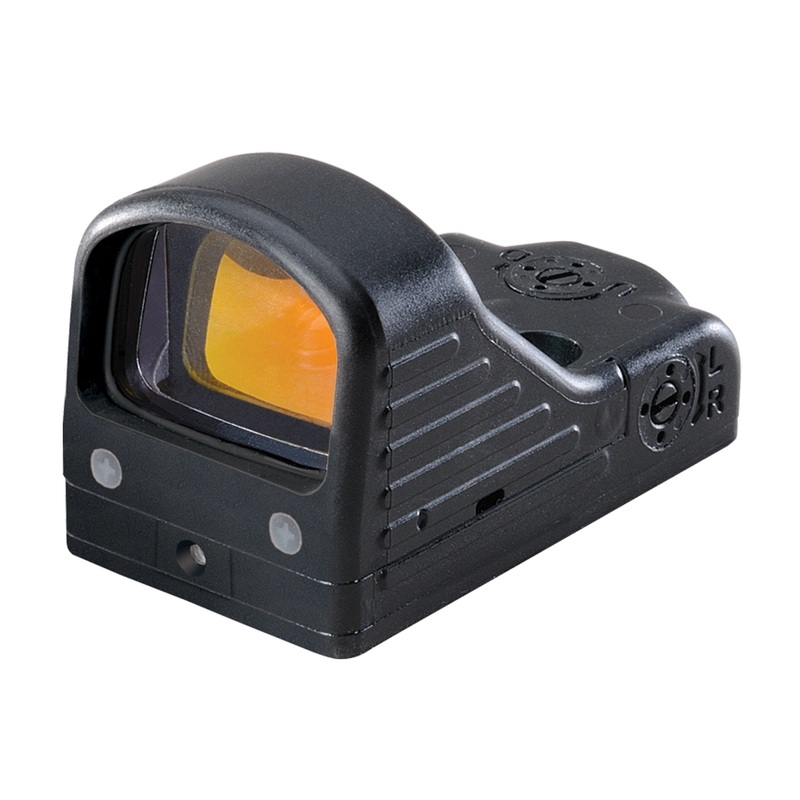 The field of view is smaller with the Aimpoint Patrol Rifle Optic so for open range use that may mean something. All of the above can get new or used in and around the $400+ or – range and all worth considering. We get a large customer base from plinkers to Special Forces. The airsoft industry has exploded and there are a lot of products that can crossover and have wide applications but ammunition, firearm maintenance and quality optics and a good operation with a good trigger finger are what win a fight. You will not find me shooting Wolf 223 in any of my AR15 rifles because even if that ammo is running in your firearm for now, there is so much crap that can build up over time that it’s not an “if” but a “when” it will cause a malfunction. There is always something new coming out at SHOT Show each year and it’s almost like the seeing the Hasbro commercials for the new Star Wars or G.I. Joe toys. They try to push an excited energy to you about how cool it is and you then ask your Mom to buy it. That same mentality goes on in the Firearm Industry and from a retail standpoint it’s same thing every year. Somebody comes in because they heard how great some new product was and we just sit back and see how well the product sells. Complaints, returns and Warranties are what we factor in with the optics we sell, but recently we have been hearing a lot of customers reference that various Red Dot optics they have been using have been performing well. Everyone one of these AR15 optics companies has a marketing department and it certainly looks like Aimpoint Red Dots are going to have a new, less expensive optic on the market. How expensive is it to make a zero magnification 2 MOA dot? As much as like the Trijicon Solar/battery technological advancements, I think they pretty much priced themselves out of the red dot market because I have a hard time justifying any quality red dot costing more than $400-$600 and the Trijicon SRS sight is almost $1000. The new Aimpoint Carbine Optic runs on one 3N battery which should last for a year turned on (please turn it off and make it last longer) but it looks like they took out the night vision ect. I still haven’t gotten accurate info on the MAP pricing is going to be but we’ll be adding several new Aimpoint products to our website shortly. There are always going to be price points and some optics are either an overkill as far as features or they are junk. We’ve pruned a lot of our inventory in recent years to try and have standards on what kind of optics we should stock because we can personally direct customers to them knowing it’s a quality product. If you have good eyesight you may notice parallax in certain optics but that is something you don’t really have to worry about in close ranges. It makes a huge difference if you are trying precision shooting at longer ranges and there are scopes that have zero parallax or have a level of adjustment to compensate. 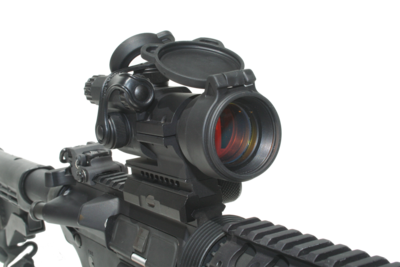 Just because you are choosing a red dot sight don’t think you can’t shoot targets at longer ranges because the Aimpoint Magnifiers will give you a much better range. It’s always a good idea to know the direction you “may” go when modifying or accessorizing your rifle so you leave room to attach Magpul Accessories, Lasers, or Surefire flashlights because depending on the location of your optic, rail sizes matter. 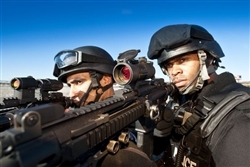 If it’s not an Eotech sight, it’s probable going to be an Aimpoint Red Dot and most likely the Patrol Rifle Optic that you might want to eyeball. Spike’s Tactical has some really cool rail systems and if you want all that gear on your gun and not an Magpul MOE stock. 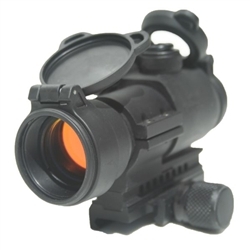 If you don’t want to deal with AA batteries or CR123 being in your go bag, then Aimpoint is the optic for you. We sold a boat load of Eotech sights last year and probable because I, personally, am a big fan of that zero magnification optic. The MOA circle and the 65MOA circle really gets picked up by my eyes and I never feel inhibited when engaging multiple targets. I’ve done quite a few optic tests at my gun range and really learned a lot in this last year pertaining to the Trijicon, Eotech and Aimpoint optics. Being that I am a firearm instructor it’s actually more fun for me to bring new shooters or less experienced shooters to the range and see how they learn. I’ve done tests with AK variants and AR15’s and time and time again ended up with shooters choosing an M4 Carbine over the AK. Usually a 50yd iron sight test and differences in hit counts between each. I won’t let this turn into an AR15 vs AK debate, but I find it hard to argue that a less trained operator will be better with an AK than an AR15. Recently we started stocking the Aimpoint Patrol Rifle Optic has a staple optic for those looking for a red dot optic under $400 that comes with a mount. Mounts can complicated decisions on optics especially when people see that it might start at a $140-$400 decision, just for a mount. Aimpoint has had the red dot market for a long time because their optics have been field tested for a long time with military coming back from War and buying the same optic for their personal firearms. 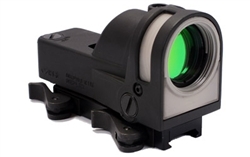 The Aimpoint Patrol Rifle optic has several night vision settings as well as other variable power settings. I highly recommend looking into getting a magnifier because you will increase your ability to identify targets as well as engage more accurately at 300yds + if need be.